Bikes 4 Life​ volunteers came together recently to prepare over 1,000 bikes to donate for a new project in Pakistan with The Akram Foundation - TAF​, and for their ongoing work in Northern Uganda. Helen C. Epstein, whose Another Fine Mess: America, Uganda and the War on Terror explores the US relationship with Uganda’s Yoweri Museveni and his involvement in five violent conflicts that erupted shortly after the fall of the Berlin Wall in the Horn and Great Lakes regions of Africa. She teaches at Bard College and Columbia's School of Public and International Affairs and writes frequently for the New York Review of Books and other publications. Ogenga Otunnu, an Associate Professor of History at DePaul University whose two volume study, Crisis of Legitimacy and Political Violence in Uganda (Palgrave 2016,2017) is the only academic work covering Uganda's entire history. He is an expert on the causes and consequences of forced migration, humanitarian emergencies and Africa and Black Diaspora studies. The first broadcast starts in 1.5 hours from now! This is the last opportunity to see this film on worldwide TV. Don’t miss out. Follow our Twitter and Facebook accounts as ahead of every broadcast we will be posting updates and reminders! A Brilliant ‪Genocide‪ is screening tonight at the Beloit International Film Festival, Wisconsin! If Beloit is in your radar please try and attend, as we would truly love to share this important, and largely untold story with you! Time / Venue: 7:30pm sharp at Domenico's, 547 E Grand Ave, Beloit! FYI: Beloit is just 2 hours drive from Chicago. Sean Stone interviews journalist Milton Allimadi about the hidden genocide taking place in Uganda and the 2016 feature documentary 'A Brilliant Genocide' which is the first of it's kind to expose the Ugandan regime for crimes against humanity including the most grave crime of all, genocide. UPDATE: RT will be streaming A Brilliant Genocide on rt.com alongside their worldwide TV broadcast on December 9, 10 and 11! It will show you the exact time slots when the show will be broadcasted in USA . All the slots are provided in GMT so just use GMT to calculate the time for Uganda and other countries. I believe the schedule will be available right after 12:00 am. RT’s flagship, award-winning English-language channel airs 24/7 from the network’s Moscow offices and is available to more than 700 million viewers worldwide. It covers the most urgent domestic and international issues of our time for viewers wishing to question more and delivers stories often missed by the mainstream media to create news with an edge. The Document International Human Rights Film Festival - Our Doc's Scottish Premiere! This is the untold story of how an African dictator has been able to commit mass murder and still get a regular audience at The White House and 10 Downing Street. 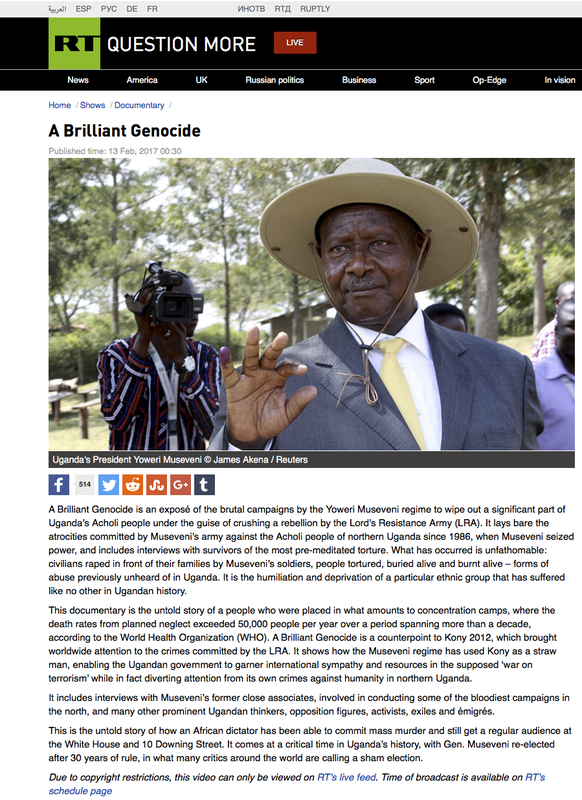 A Brilliant Genocide is a political expose and human rights documentary that details the untold story of suffering and an unrecognized genocide against the Acholi people of northern Uganda by the current Government, under President Yoweri Museveni, who has for decades been staunch ally to the west. But has the West been hoodwinked by this deceptive devil in disguise, the face of democracy in Africa, the US’s strongest ally in the region and who Clinton once called “a beacon of hope on the African continent”, or have they turned a blind eye and knowingly been dancing with the devil for their own selfish and strategic interests? Adam Branch during an interview for the film 'A Brilliant Genocide' in Uganda 2012. Adam Branch is currently at Cambridge University however at the time he was a senior lecturer at Makerere University, Kampala. Today, Western intervention is a ubiquitous feature of violent conflict in Africa. Humanitarian aid agencies, community peacebuilders, microcredit promoters, children's rights activists, the World Bank, the International Criminal Court, the US military, and numerous others have involved themselves in African conflicts, all claiming to bring peace and human rights to situations where they are desperately needed. However, according to Adam Branch, Western intervention is not the solution to violence in Africa but, instead, can be a major part of the problem—often undermining human rights and even prolonging war and intensifying anti-civilian violence. Based on an extended case study of Western intervention into northern Uganda's twenty-year civil war, and drawing on Branch's own extensive research and human rights activism there, Displacing Human Rights lays bare the reductive understandings motivating Western intervention in Africa, the inadequate tools it insists on employing, its refusal to be accountable to African citizenries, and, most important, its counterproductive consequences for peace, human rights, and justice. In short, Branch demonstrates how Western interventions undermine the efforts Africans themselves are undertaking to end violence in their own communities. Displacing Human Rights does not end with critique, however. Motivated by a commitment to global justice, it proposes concrete changes for Western humanitarian, peacebuilding, and justice interventions as well as a new normative framework for re-orienting the Western approach to violent conflict in Africa around a practice of genuine solidarity. We interviewed Ugandan opposition leader Dr Kizza Besigye a few years back when we were in Uganda doing research for our film, 'A Brilliant Genocide'. Kizza Besigye, who has ran for president four times and many claim was the rightful winner of this years elections, is being detained at home as police break up public rallies. There is also a current media ban for an media outlet covering Besigye's Defiance Campaign. Lyandro Komakech from the Refugee Law Project (and MP for Gulu, Northern Uganda) discusses the rise of Ugandan rebel leader Joseph Kony, in the 2016 documentary film A Brilliant Genocide. The groundbreaking documentary is currently featuring in festivals across America and Europe and is planning a TV release later in the year, exposing untold stories about the war and western complicity that is shocking audiences worldwide. A Brilliant Genocide examines the hidden history of the Ugandan regime of Yoweri Museveni. It lays bare the atrocities committed by Ugandan government soldiers against the Acholi people of Northern Uganda since 1986. The documentary is a counterpoint to 'Kony 2012', a viral video sensation which brought worldwide awareness to the crimes committed by the Lord’s Resistance Army under rebel leader Joseph Kony. Utilising a substantial range of interviews from prominent Ugandan thinkers, opposition figures, activists, exiles and émigrés, A Brilliant Genocide presents an unmatched and uniquely Ugandan interpretation of Uganda’s recent history. Follow and share A Brilliant Genocide's work and help to #EndTheSilence in Uganda and around the world. 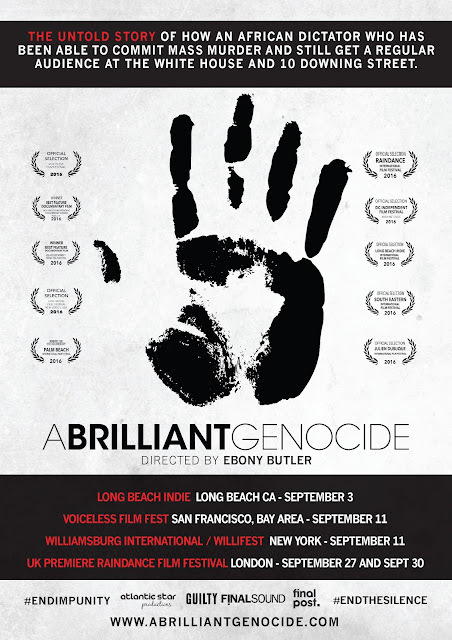 A Brilliant Genocide - Trailer from Ebony Butler on Vimeo. 'A Brilliant Genocide' is an expose of how an African dictator has been able to commit mass murder and still get a regular audience at The White House and 10 Downing Street. Copyright: Atlantic Star Productions Pty Ltd, 2012. Awesome Inc. theme. Powered by Blogger.